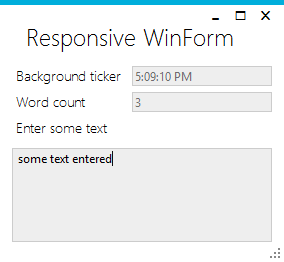 This is the next post in the series, looking first at Reactive Extensions (RX) to simplify writing Windows Forms UI logic, then using a viewmodel shared between a WPF gui implementation and a rewritten WinForms version using ReactiveUI, stopping at a short article on testing the viewmodels. ReactiveUI API has been quite volatile for the last year, and this series is in need of an update[0. See ReactiveUI Design Guidelines]. A CodeProject author gardner9032 published a nice teaser article, showing the ReactiveUI mechanism for writing simplified Viewmodel-View bindings [1. see article @CodeProject], which serves as primary trigger for this post. There’s plenty of news and updated articles on Paul Betts’ log, providing a good resource for updates on the API. Phil Haack’s blog is also a superb resource for explanations and commentaries on the use of ReactiveUI in real-world applications. The ReactiveUI project is quite active, as the community seems to have grokked the jist of it, while the list of supported platforms has become more than convincing. The enabling feature of ReactiveUI is writing declarative UI glue code, and if the viewmodels are based on Reactive Extensions, then declarative C# style can be used throughout the project. The previous ReactiveUI Windows Forms examples converted an event sequence into an observable sequence of values. In this example, that will be accomplished conveniently by the ReactiveUI WinForms lbrary. The viewmodels also contained some imperative code. For this article, the viewmodels will not be reused from the previous articles, but written from scratch. The viewmodel’s task is the same: something is ticking in the background, while words are counted in the input text asynchronously, and the calculation is throttled to 0.5 seconds. The viewmodel boilerplate is simplified using ReactiveUI.ReactiveObject. The ReactiveUI-way of creating output properties is through ObservableAsPropertyHelper. Word counting logic is implemented in a similar fashion by transforming the incoming stream of strings. … and declaring the bindings[2. The ReactiveUI WinForms implementation seems not to support fully read-only fields using default bindings yet, hence an empty setter in the viewmodel] [3. The scheduler is from Windows Forms helpers]. This entry was posted in c#, DLed, Programming and tagged declarative, hello world, ischeduler, mvvm, reactive, reactive extensions, reactiveui, reactivexaml, responsive, rx, simple, synchronizationcontext, tutorial, viewmodel, Windows Forms, WinForms on December 29, 2014 by DLed.